It was at a meeting at the European Parliament offices in London before Christmas that I heard that Local Authorities would be going the same way as the Dodo if young Miliband (Pitt the even younger) is set loose on them by Downing Street. 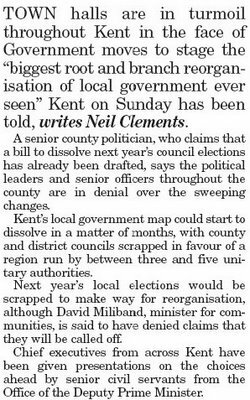 It now appears that there is little point in thinking about next year’s local council elections, as they are likely to be called-off. 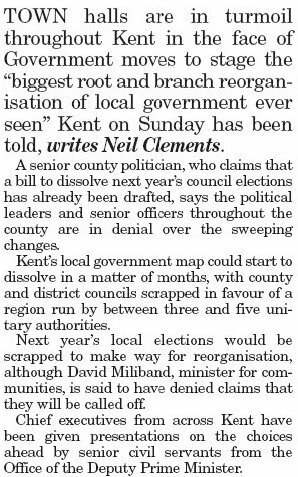 Tomorrow’s Kent on Sunday has the story and an ‘exclusive’ report on the subject but the evidence points to local democracy as we know it being quickly extinguished in the next twelve months. Alright, we moan about the sorry state of politics in Thanet but at least we have something to ‘winge’ about. In future our lives could well be controlled from a distance or more so than they are today. Perhaps one of our local politicians will be promoted to the role of “Commissar”. It does sound much better than “Councillor” and I’m sure we’ll have a five year plan to follow from the Office of the Deputy Prime Minister as well. I’m reminded that the Peasant’s Revolt had its roots in Kent and funnily enough, the records show that a number of the instigators came from Thanet. This was of course a revolt against the imposition of a ‘Poll Tax’ and it was really the small landowners, the emerging middle class of the time, that rose up against the rapacious greed of the government of King Richard the second or more accurately, his Deputy Prime Minister, his uncle, John of Gaunt. Perhaps it’s time for the people of Kent to march on London once again in protest against the poll tax, the potential loss of local democracy, energy prices, income tax and much much more.... You tell me. Miliband says that next years local elections (which includes Thanet as Simon comments) wont be cancelled. However Ive read that it was minuted that it had been discussed at a high level. The logic is, whats the point of an election next year if local government is to be re-organised the year after? The logic does not wash for me. The people must be allowed their say on Thursday 3rd of May 2007. The TDC Constitution clearly states this. Labour truly has contempt for this country. "Labour truly has contempt for this country" because the idea of postponing next year's elections for a year (not cancelling by the way)has been rejected by the minister. This must rate as the silliest statement yet. The main article talks of a collapse of democracy when what is being considered for consultation is replacement of District and County with Unitary authorities. This would give greater control over highways for instance, a subject Mr Maskell claims to be critical of County over. A silly question maybe but has anything Tony Blair has done to fiddle with this country's democracy done any good anywhere? e.g SEERA, Regional Authorties and more I'm sure. Postponing elections has nasty ring to it. Isn't that what happened in Zimbabwe? Devolution to Scotland and Wales, devolution to London. Increased powers to local authorites over licensing, community safety, private housing conditions ect, more powers to GP's, Hospitals and School to run their own affairs, to think of a few off the top of my head. Cllr David Green goes for the cheap attack before making his response proper. Why am I not suprized? The statement is not silly at all. Its a perfectly reasonable one. This Government has discussed at a high level the possibility of cancelling the elections. If the elections are to be postponed, then that means that TDC will be retained in its current state. What is being talked about here is a complete re-organisation which would mean a cancellation of next years elections, not a postponement. The people have the right to vote every four years for TDC Councillors. This Labour Government will stop that from happening. It's a nice list David but I'm not convinced we are writing about the same country. Anonymous of 9:47 has a point, does any of it work? and the answer is pretty clearly not, in most cases I can think of and in terms of tangible results, quality of life and total cost to the taxpayer. Now I'm writing here as one who once supported this government's ideals, was very close to No10.. even inside it and was sufficiently discouraged if not disgusted enough to walk away on principle. Devolution for England is what is needed. I dont know who or even if,I am represented democratically by a Councillor on SEERA or is it an undemocratic Preston invention? I am happy with a TDC and a KCC structure, just about. I can at least share my concerns with my local TDC and KCC representatives and they are subject to local opinion even if too often they ignore it. A regional set up weakens England's case for devolution from the unrepresentative UK parliament.